Sunil Grover (born 8 March 1977) is an Indian actor and stand up comedian. He came into limelight for his portrayal as Gutthi on Comedy Nights with Kapil but gained popularity for playing the role of Dr Mashoor Gulati on The Kapil Sharma Show. Grover will next be seen in Bollywood film Bharat. 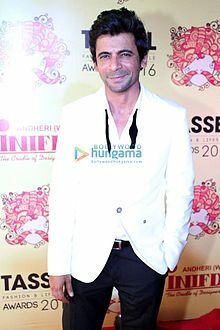 Sunil Grover was born on 8 March 1977 in Sirsa, Haryana. He received Master's Degree in Theatre from Panjab University Chandigarh. He is married with a son. Sunil was discovered during his college days by the late satirist and comedian Jaspal Bhatti. He has also acted in India's first silent comedy show, SAB TV's Gutur Gu in the initial 26 episodes. He was with comedian Kapil Sharma in the comedy show Comedy Nights with Kapil and became popular for playing comical characters: Gutthi, Rinku Bhabi and Dr. Mashoor Gulati. Sunil debuted in the Punjab film industry, with Vaisakhi List in 2016 and the same year he portrayed the role of Shraddha Kapoor's father in the Baaghi movie. ^ a b c "Everything You Need To Know About Sunil Grover Aka Gutthi". indiatimes.com. 14 March 2016. Retrieved 7 March 2019. ^ a b "Happy Birthday Sunil Grover: RJ Sud to Gutthi to Rinku bhabhi, his journey has been a laugh fest. Watch videos". The Indian Express. 8 March 2017. Retrieved 7 March 2019. ^ "'Pataakha': Vishal Bhardwaj reveals the look of five main characters | Bollywood Bubble". Bollywood Bubble. 2018-08-11. Retrieved 2018-08-11. ^ Sunil Grover aka GutTV News (Jul 26, 2014). Retrieved 26 April 2016. ^ Sunil Grover's Chutki fails to recreate Gutthi magic Archived 10 March 2014 at the Wayback Machine. Hindustan Times (21 February 2014). Retrieved on 2015-08-13. ^ Sunil Grover in new avatar as Sabjee. Zeenews.india.com (11 March 2014). Retrieved on 2015-08-13. ^ a b c "I love being a 'wanna-be' sometimes: Sunil Grover". Hindustan Times. October 18, 2013. Retrieved September 23, 2017. ^ There are so many girls like Gutthi: Sunil Grover – The Times of India. Timesofindia.indiatimes.com (29 October 2013). Retrieved on 2015-08-13. ^ I left 'Comedy Nights with Kapil' to earn more money: Sunil Grover. Ibnlive.in.com (5 December 2013). Retrieved on 2015-08-13. ^ "Sunil Grover shoots for Comedy Nights". Patrika Group (24 July 2014). Retrieved 24 July 2014. ^ Sunil Grover’s ‘Mad In India’ a poor version of Comedy Nights with Kapil. The Indian Express (21 February 2014). Retrieved on 2015-08-13. ^ Sunil Grover's new role on Mad In India is child named Sabjee. Movies.ndtv.com. Retrieved on 13 August 2015. ^ Sunil Grover says, My intentions are to act and to entertain with dignity. The GenX Times. Retrieved on 6 April 2017. ^ "Sunil Grover earns praises for his performance on the grand finale of Indian Idol Season 9 finale". The Times of India. Retrieved April 2, 2017. ^ Radio Ha-ha | Business Standard News Business Standard > Beyond Business (September 14, 2008). Retrieved 26 April 2016. This page was last edited on 15 April 2019, at 11:05 (UTC).